No. 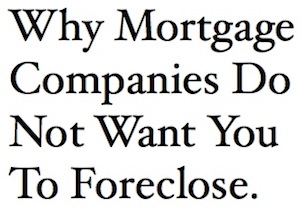 Its not what the mortgage company wants. Not even close. And I’ll do my best to tell you why. Mortgage companies are in the business of making loans. All they want to do is make money by originating loans and selling these loans to investors or keep the loans and collect the interest. When a borrower misses 4 payments in a row the lender has the option to start foreclosure proceedings on the home. It is in the contract you signed with them and they are only doing what the contract says. After you have missed 4 payments the bank holding the mortgage note has not received 4 months of interest on the principle balance they lent you. $200k balance on a 30 year mortgage at 6% would have a principle and interest payment of $1200 a month in which $1000 of that is strictly interest. So in the 4 months you have missed these payments that’s $4800 that the bank could not lend back out or use to pay their own bills and salaries to their employees. As soon as the foreclosure starts the bank has to hire people to go out to the property to see what condition it is in and if it needs to brought back up to code. The local government will have to be contacted to get the previous owners name off of the deed. Then a realtor has to list the property. All of these people do not work for free and now the bank has to dip into their savings to pay these people to hopefully get it sold. Since the bank owns the house now they have to do things like cut the grass and pay property taxes. So really that $1200 payment is low. It’s probably more like $1500 now with taxes and home owners insurance. The bank is now spending money to keep the house in working order while they try to sell it. Even if they are to sell it, the banks usually undercut all the homes in the area so they can get it off their books. Most banks take a big loss with foreclosures. There is usually a loan that is still over 80% of the value of the home. So even if they sell it with 10% in equity they missed out on the monthly payments not made to them. And now they have to pay property taxes, upkeep, realtor fees, paying the next door neighbor kid $15 a week to cut the grass while they sell it. Costs add up quickly. The mortgage company is also not doing what they want to do which is sell new loans. They are instead having to spend a lot of time cleaning up the financial disaster that a foreclosure is so they can move on. A borrower that takes out a $200k loan at 6% will pay $231,676.38 JUST IN INTEREST over the span of 30 years. So this means that you will pay $431,676.38 total over 30 years to pay off your house if you just make your minimum monthly payments. Kind of makes you want to be a bank now huh. Just sit back and watch the checks come rolling in every month for basically working one time. The mortgage company is always going to be the one that is going to get the bad rap in this one. It’s so easy to blame the bank but nobody ever said that I should have never taken that loan because I could not afford it. The trickle down starts happening where banks have to start laying people off because you could just not make your payment. Jobs are lost and mortgage companies fold. Your neighbors are affected because the mortgage company has to sell the foreclosed property below market just to get it off their books as soon as possible. No, the mortgage company does not want your house. They want you to stay in the house making your mortgage payments on time for the entire length of the loan. That’s how they make their money. Collecting interest from the payments you send them. That’s it. I don’t buy what you just said. Do you think mortgage companies want to be home owners?